consider the following scenario: I have a storyboard-based app. I add a ViewController object to the storyboard, add the class files for this ViewController into the project and specify the name of the new class in the IB identity inspector. Now how am I going to refer to this ViewController programmatically from the AppDelegate? I've made a variable with the relevant class and turned it into an IBOutlet property, but I don't see any way of being able to refer to the new ViewController in code - any attempt to ctrl-drag a connection doesn't work. 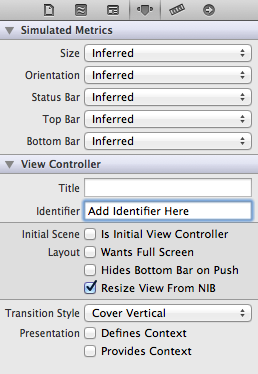 but how about any other ViewController contained within the storyboard? UIStoryboard *mainStoryboard = [UIStoryboard storyboardWithName:@"MainStoryboard"
If you use XCode 5 you should do it in a different way. Generally, the system should be handling view controller instantiation with a storyboard. What you want is to traverse the viewController hierarchy by grabbing a reference to the self.window.rootViewController as opposed to initializing view controllers, which should already be initialized correctly if you've setup your storyboard properly. You really shouldn't be initializing view controllers using storyboard id's from the app delegate unless you want to bypass the normal way storyboard is loaded and load the whole storyboard yourself. If you're having to initialize scenes from the AppDelegate you're most likely doing something wrong. I mean imagine you, for some reason, want to send data to a view controller way down the stack, the AppDelegate shouldn't be reaching way into the view controller stack to set data. That's not its business. It's business is the rootViewController. Let the rootViewController handle its own children! So, if I were bypassing the normal storyboard loading process by the system by removing references to it in the info.plist file, I would at most instantiate the rootViewController using instantiateViewControllerWithIdentifier:, and possibly its root if it is a container, like a UINavigationController. What you want to avoid is instantiating view controllers that have already been instantiated by the storyboard. This is a problem I see a lot. In short, I disagree with the accepted answer. It is incorrect unless the posters means to remove loading of the storyboard from the info.plist since you will have loaded 2 storyboards otherwise, which makes no sense. It's probably not a memory leak because the system initialized the root scene and assigned it to the window, but then you came along and instantiated it again and assigned it again. Your app is off to a pretty bad start! Not the answer you're looking for? Browse other questions tagged iphone objective-c ios uiviewcontroller storyboard or ask your own question. iOS: Check if user is already logged in using Facebook? How to call the func in ViewController from appdelegate in Swift? How can i access a ViewController that's a segue from a Tableview in another ViewController from my AppDelegate? How to subclass a ViewController which has IBOutLet and IBAction from storyboard?